Figure 32.3. Time to treatment according to baseline involved FLC concentration. (Republished with permission from Haematologica). Figure 32.4. (A) SPE and serum immunofixation electrophoresis on samples at room temperature. (B) SPE on a sample at 37°C. (Reproduced by permission of SAGE Publications Ltd., London, Los Angeles, New Delhi, Singapore and Washington DC, from, © R.J. Pattenden, 2009). Figure 32.5. sFLC results at baseline and following initiation of chemotherapy. The κ/λ sFLC ratio had normalised by day 400 . Itzykson et al. examined the prognostic utility of baseline sFLC measurements in 42 WM patients prior to treatment. iFLC concentrations were significantly increased in patients with adverse prognostic markers (elevated β2-microglobulin >3 mg/L or low albumin <35 g/L; p<0.05). 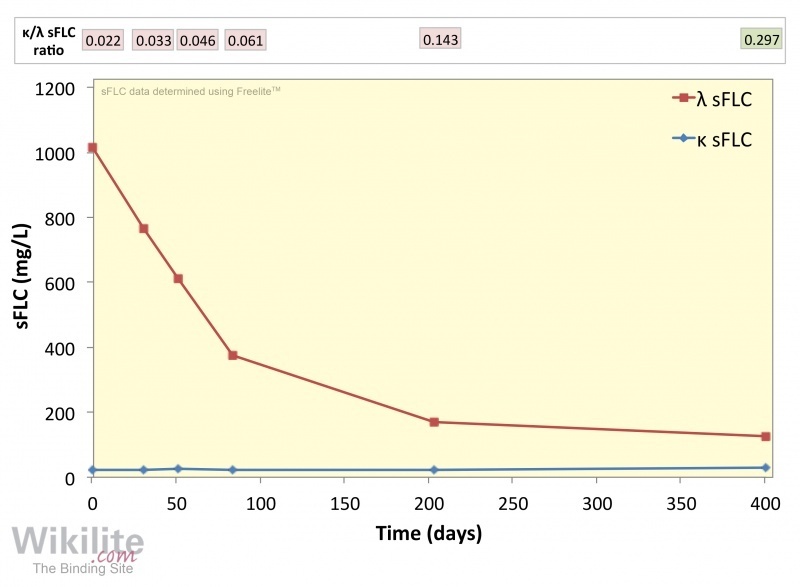 Furthermore, elevated iFLC concentrations (>80 mg/L) were independently associated with progressive disease and a shorter time to treatment (Figure 32.3). Similar findings were reported by Leleu et al. who demonstrated that elevated concentrations of sFLC (>60 mg/L) were associated with adverse prognostic markers (elevated β2-microglobulin or IgM, or low haemoglobin) and reduced overall survival. In a separate study, Leleu et al. investigated the prognostic significance of a sFLC response in a prospective study of 72 WM patients. 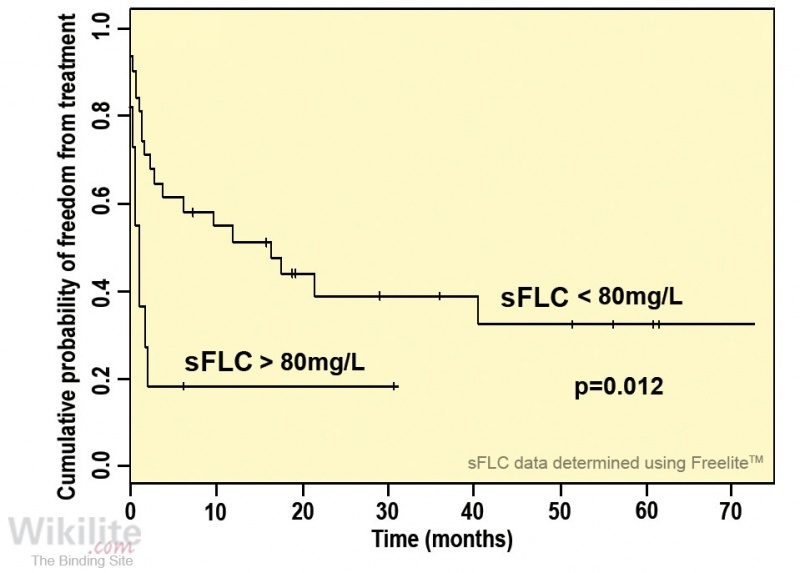 The 3-year probability of survival was significantly higher for those patients with sFLC concentrations <80 mg/L (96.8%) compared with those patients with values >80 mg/L (57.5%; p=0.05). The authors concluded that sFLC measurements should be included in future clinical WM trials to validate their results. Paludo et al. studied the prognostic value of a normal sFLC ratio following treatment among 79 WM patients who achieved a partial response (PR) or very good PR. In a multivariate analysis that included IgM concentration and bone marrow involvement, a normal sFLC ratio remained prognostic for longer progression-free survival and time to next therapy. This study is the first to demonstrate the prognostic value of monitoring sFLCs following treatment in WM. The value of sFLC analysis for monitoring in a case of Waldenström's macroglobulinemia with a type 1 cryoglobulin. An 82-year-old male with chronic kidney disease (stage 3) and diabetes was referred to the haematology department by his general practitioner based on results of routine investigations . These revealed that he was anaemic (haemoglobin 8.9 g/dL) and had an elevated plasma viscosity (15 cp) with a serum total protein of 102 g/L. 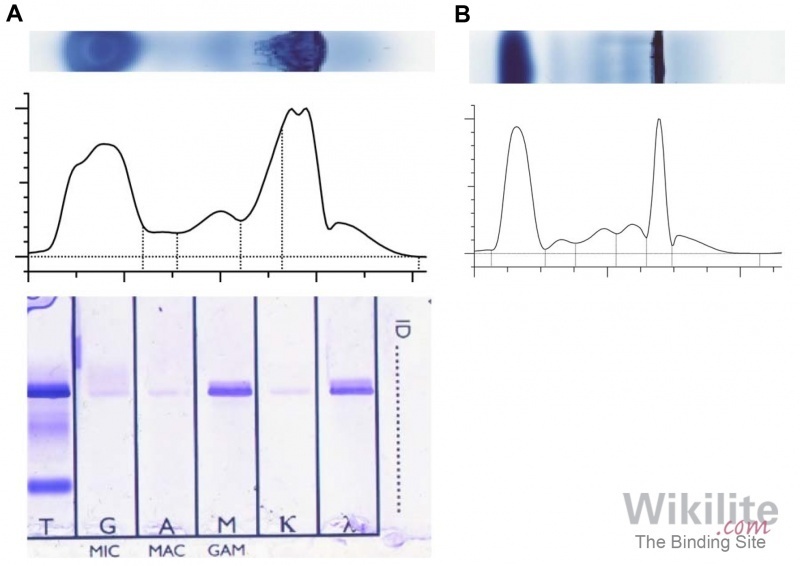 SPE revealed a monoclonal protein which was typed as an IgMλ, but this could not be accurately quantified as it precipitated out in the gel (Figure 32.4A). Furthermore, the serum sample appeared clotted after being stored at 4 °C, which was reversed once the sample was warmed to 37 °C, consistent with the presence of a cryoglobulin. Haematological assessment highlighted symptoms which were consistent with hyperviscosity syndrome. These included dyspnoea, epistaxis, blurring of vision and sensory neuropathy, requiring plasma exchange. Although a diagnosis of WM was now expected, a rare case of IgM multiple myeloma could not be ruled out. A bone marrow aspirate was inconclusive but a trephine biopsy and immunohistochemistry confirmed the diagnosis of WM. Cryoglobulin analysis confirmed the presence of a type 1 cryoglobulin (Figure 32.4B). The patient started a course of chemotherapy, and serial measurements of sFLCs were used to assess response (Figure 32.5).